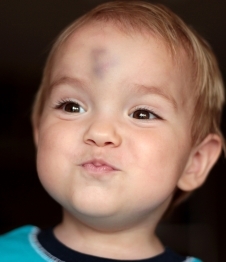 Children often bump their heads, because they are active, enjoy rough-and-tumble play, and sometimes fall over. Fortunately, they mostly injure the outside of their heads, not their brains. The term "head injury" refers to injuries you can see on a child's scalp as well as internal injuries to their brain. Brain injuries are sometimes called traumatic brain injuries, and concussion is sometimes called a minor traumatic brain injury. Our foreheads and scalps have a very good blood supply, and knocks or injuries to these areas often cause bleeding under the skin. When the bleeding is mainly in one area, it causes swelling and bruising, which appears as an "egg" or swelling on a child's head. It may take days or even a week to disappear. While these can be scary-looking, they usually aren't dangerous. Even a small head bump can cause a large swelling. aren't walking or talking normally. Phone 111 for an ambulance if you are worried in any way about your child after they have bumped their head. You should always take your child to a doctor if you think someone may have hurt them on purpose. What should I do if they seem to be OK? If your child has bumped their head and they are not a baby, have not been knocked out, and seem to be alert and behaving normally, you will need to keep a close eye on them for 24 hours. If you notice any of the signs above, take them to a doctor straight away. apply an ice pack or a bag of frozen peas, wrapped in a cloth, to the injured part of their head for 10 minutes, every three to four hours. Your child may cry or be distressed. This is normal, and most children will settle down within 15 minutes as long as they get the right attention and reassurance. If they don't settle, take them to a doctor. If the accident happened close to bed or nap time and your child goes to sleep afterwards, check them a few times while they sleep. Try to wake your child – they should grumble a bit and try to go back to sleep. If they seem very drowsy, even when you have tried to wake them by sitting them up, see your GP or dial 111 for an ambulance. Also read about how to prevent future head injuries. This leaflet guides you through the steps of increasing activity after your child has had concussion. Written by HealthInfo clinical advisers. Endorsed by paediatrician, Canterbury DHB. Page created October 2017.